When rambunctious rockers Simple Plan released their 2002 Lava Records debut, NO PADS, NO HELMETS... JUST BALLS, the band more than just hit the ground running. Just inside of a year, Simple Plan crossed five continents and played over 300 shows. Along the way, the band picked up a few hundred thousand fans, topped the Alternative New Artist Chart, kicked it on MTV TRL, scored a Gold album in home country Canada as well as Japan, and sold out their first ever tour of Japan. Sprinkle in a few trips to the hospital, a dozen nights spent sleeping on airport floors, one tour bus in a ditch and one broken-down in the desert and the method to madness becomes clear... this band is absolutely pummeling the pavement. And that's the edited version. This zest for life is what went into making "NO PADS" sheer punk pop fun. The album, produced by Arnold Lanni (Our Lady Peace, Finger Eleven), features 12 irresistible anti-anthems of adolescent alienation, such as the effervescent, "I'm Just A Kid," the hearty shout-it-out-loud "I'd Do Anything," and the extremely addictive "Addicted." Rewind for a minute to the mid-90s, when singer Pierre Bouvier and drummer Chuck Comeau were 13-year-old bandmates in Reset, a loud and fast punk outfit who released a much-praised debut album in 1997 and toured Canada with the likes of MXPX, Ten foot Pole, and Face To Face. Soon, both had left Reset, first Chuck, then Pierre, to initially go back to school. Not so fast there. First Chuck was drawn back to music and hooked up with high school friends and guitarists Jeff Stinco and Sebastien Lefebvre. Add in singer and old band buddy Pierre and another former Reset member, David Desrosiers on bass, and Simple Plan was born. Simple Plan's expertly crafted tunes are predominantly penned by Chuck and Pierre, then brought to life by the entire band. "Jeff will come up with lots of rad guitar leads and textures," notes Pierre. "Seb is great at helping out with the arrangements, and David always has good ideas with harmonies." Despite the manic pop thrills of tracks like the Ferris Bueller worthy sing-along "Worst Day Ever" and the powerful "God Must Hate Me," Simple Plan's songs are marked by a strikingly dark lyrical core. "After writing most of the record, we realized that we had a bunch of catchy songs with really emotional lyrics," Chuck says. "We thought it was such a rad contrast. There's lots of people out there who are not really satisfied with what's going on in their lives, and it's the same thing for us. It's so hard to grow up and fit in." "We know what kids go through, because we've been through that, and we're still going through it, so we know how hard it is." Pierre agrees. "We want kids to feel like we're talking about them and for them. It's such a good feeling to receive a letter or an e-mail from someone who relates to our songs and says "Damn, you're singing about exactly what I feel.'" That band-to-fan connection is noticeably apparent in the album's introductory single, "I'm Just A Kid." The song is as powerful in its expression of teenage angst as it is ridiculously infectious. "I'm Just A Kid' is about how it's hard to fit in and find your place," Chuck says. "It's tough to meet people who are there for you in the end, people who care." Other tracks on the album like the gutsy "Meet You There" and the touching "Perfect" substitute a more atmospheric and bittersweet energy in place of upbeat punchy hooks. "I hate the word mature," says Chuck, "but they're just a bit different." "NO PAD, NO HELMETS... JUST BALLS" was recorded at producer Arnold Lanni's Arnyard Studio in Toronto. The sessions saw Simple Plan making a pair of trips across the border in order to work with a couple of musician friends who wanted to be part of the album. First, the band headed to Buffalo, New York, where they hooked up with Joel of Good Charlotte, who contributed vocals to "You Don't Mean Anything." In addition, Simple Plan enlisted another friend none other than Mark Hoppus of blink-182 to lay down backing vocals on the second single and MTV TRL breakout, "I'd Do Anything." "We've known each other for a long time," says the drummer. "We played shows with blink back on their first record and we stayed friends. Mark's such a down-to-earth guy. He took the time to do his track and really nailed what we wanted. We're honored to have him sing on our record." With a debut album that's everything they'd hoped it would be, and some experiences they never could have imagined, Simple Plan intends to spend 2003 bringing the adrenaline-fuelled tunes of "NO PADS, NO HELMETS... JUST BALLS" to the kids by doing what they've done from the get-go hitting the road. And hard. "First we wanted to make sure that every song was special," Chuck avows. "Now we just want to play every day. I said to everybody that works with us, We don't need any days off, just book us.' We'll be on the road for two years. This summer we're doing our second Warped Tour for this album. That's so amazing. It's like the name, Simple Plan. 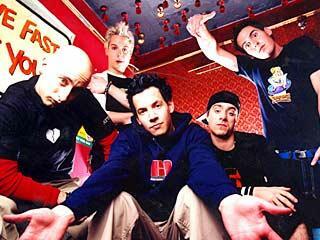 We just have this simple plan to go on the road and meet people and make new friends and just see who likes our band."